Vegas Strip Blackjack is one of the most essential variants in the American blackjack series, along with Vegas Downtown Blackjack and Atlantic City Blackjack. Learn how to play this popular game of 21, the rules and how Vegas Strip differs from classic blackjack. At its core, Vegas Strip follows the same basic rules as classic blackjack and as with all blackjack variants, the aim is to acquire a hand with a higher value than the dealer without busting a total of 21. The style of the table, dealing process and blackjack terminology is the same for both variants. The differences between the two lie in the smaller details, like the amount of decks used and small spins on certain rules and player moves. If you are familiar with the rules of classic blackjack you will have no trouble picking up the rules of Vegas Strip. Vegas Strip is considered to have one of the lowest house edges of all blackjack games, second only to classic blackjack. When following the standard rules as detailed above the house edge of Vegas Strip is 0.35%. To take advantage of better odds of winning, blackjack strategists advise players of Vegas Strip to avoid games that offer a payout of 6:5 and to avoid taking insurance. Blackjack in general has a lower house edge than other casino games, so with the low edge of this variant, Vegas Strip is a great choice for hopeful winners. Vegas Strip Blackjack used to be a popular variant played by Australians at online casinos, before new laws were introduced in September 2017 that made it illegal for online casinos to offer real money services to Aussie players. Unfortunately, Aussies can no longer play blackjack online, but you can read more about the blackjack variants available at land based casinos like Crown Perth and Star Sydney. If you are located outside of Australia, Choosing to play Vegas Strip Blackjack online or at a mobile gambling venue as opposed to in a land based casino offers many benefits. First and foremost there is the convenience of being able to play whenever you like, from wherever you like in the comfort of your pyjamas if you so desire. Secondly, although this is a popular blackjack variant found in real life casinos around North America, it is not commonly found outside of the United States. Melbourne’s Crown Casino does offer Vegas Strip Blackjack, but only to high rollers with bankrolls high enough to gain them entry to the exclusive Mahogany Room. 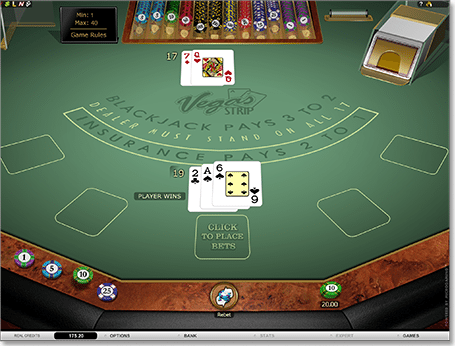 Playing Vegas Strip online means players outside of North America can still enjoy this leading blackjack variant without having to fork out for airfares or hotels to the USA. Thirdly, online casinos offer more leniency when it comes to minimum and maximum bets than you’ll find in a b&m casino. Blackjack tables at land based casinos can impose minimum bets that quickly restrict the bankrolls of recreational players, while online blackjack tables offer lower minimum wagers making them more affordable.